CATARMAN, Northern Samar – In order to address issues on government efficiency and effectiveness in the delivery of services, the task force on good governance of the Northern Samar Peace and Development Forum (NSPDF) has finalize its action plan Wednesday morning at Sophie’s Restaurant, University of Eastern Philippines, Catarman, Northern Samar. The group prioritized and targeted the advocacy of the following: transparency in public governance, public-private partnership for growth and employment, poverty alleviation, quality education and children’s welfare. For transparency in the local government unit, the group decided to monitor the politician’s term based plan that were submitted to DILG, the promotion of the Community-Based Monitoring System (CBMS), and for LGUs to give priority on employment and economic development. While for poverty alleviation, the monitoring of Pantawid Pamilyang Pilipino Program (4Ps) and monitoring of agricultural program were also on top of the list to be done by the task force. Likewise, the conduct of job fairs and seminar workshop for small scale businesses will be done within the second quarter with DTI, DOLE, TESDA and NSPESO spearheading the event. However, for children’s welfare, the group asked the head of DSWD in the province to update and apprise the members as to the implementation of the Northern Samar Local Children’s Code on February 4 during the NSPDF scheduled quarterly meeting. On quality education, the promotion of the Alternative Learning System (ALS), the conduct of information education campaign for parents, lobbying for the allocation of funds for locally paid teachers, and increase support of stakeholders on public education were among the things discussed during the meeting. The meeting was participated in by Rev. Fr. Fred Placa, the chair of the task force, Engr. Romeo Cardenas of PPDO, Mrs. Carmen Mejia of PSWDO, Mrs. Althea Basiloy of UEP, PNP Provincial Director Col. Brigido Unay, Mrs. Teresita B. Cardenas of PIA, Mr. Fortunato Lagarde of DILG, Col. Malinao of 803rd Brigade and Ferminlino Ultra of UEP Association of Law Students (ALAS). NAVAL, Biliran – Naval, the capital town of the province of Biliran and classified as 2nd class municipality, was nominated to the DOH Red Orchid Awards 2011 for its efforts in controlling smoking in the town particularly in public places and public utility vehicles. The town of Naval through its local legislative body enacted Municipal Ordinance No. 03-2010 or “The Smoke Free Ordinance of the Municipality of Naval” to regulate and prohibit the use, sale, distribution, and advertisement of cigarettes and other tobacco products in certain places of the municipality. Talks with the sectors in the community were tackled to disseminate the provisions of the said ordinance, including the penalties it entails for violators. Formal launching and implementation of the said ordinance is on February 7 with its task force to monitor and enforce said law. The DOH Red Orchid Awards 2011 aims to commend the 100% tobacco-free provinces, municipalities, cities, government offices, DOH Centers for Health Development and DOH hospitals to save the 10 Filipinos who die every hour and the one-third of the population who is at risk of dying from debilitating diseases due to tobacco use; to save the estimated P149 billion annually lost due to productivity and health care cost of the top 4 tobacco-related diseases, namely: cancer, heart disease, stroke, and chronic obstructive pulmonary disease; and to protect the youth from the harmful effects of tobacco use and exposure. Centers for Health Development (CHD) have started the screening and validation of the nominees in November 2010. Awarding of winners is on May 31, 2011. The Technical Working Group Validation Team is considering their assessment on the ‘MPOWER’ strategy which stands for Monitor tobacco use and prevention policies; Protect people from tobacco smoke; Offer help to quit tobacco use; Warn against the dangers of tobacco; Enforce bans on tobacco advertising; and Raise taxes on tobacco. TACLOBAN CITY, Leyte – The Civil Service Commission has recently conferred the Citizen’s Satisfaction Center Seal of Excellence to two local government units in Eastern Visayas. CSC Region 8 Director David E. Cabanag, Jr. identified the local government units as the Municipal Government of Burauen, Leyte and the City of Borongan in Eastern Samar. The conferment, Ms. Eleonor Garcia, RSU chief of CSC 8 informed that the conferment was held during the “Pasidungog” conducted at the DPWH Multi-Purpose Center, with CSC Commissioner as the guest of honor. Mayor Fe Renomeron led the local officials and department heads of the Municipality of Burauen while Mayor Maria Fe Abunda was represented by SP Karen Alvarez and other officials and employees of Borongan City, in receiving the wall-mountable glass seal and cash reward. The award was the result of a nationwide Report Card Survey conducted by Civil Service Commission Regional Offices in July and August 2010 in agencies earlier identified as Model in the ARTA and Citizen’s Charters. Report Card Survey is an evaluation tool that provides a quantitative measure of actual public service user perceptions of the quality, efficiency and adequacy of different frontline services as well as a critical evaluation of the office or agency and its personnel. The target respondents for the survey were individual clients who have availed of the frontline services of any frontline service of government agencies. The survey was conducted in the agency premises immediately they finished availing of availing of a frontline service. The survey included the quality of service provided to them, as well as the physical working condition of the agency. 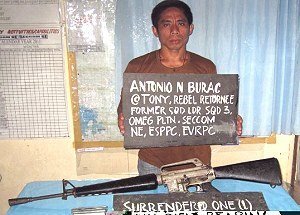 CAMP LUKBAN, Catbalogan, Samar – After his decision to surrender sometime in 2009, a former NPA rebel surrenders anew one (1) M16 rifle with one (1) magazine containing ten (10) rounds of ammunition around 4:00 pm last January 27 to the elements of the Army’s 14th Infantry Battalion based in Oras, Eastern Samar. In the report submitted by Lieutenant Colonel Hermilo Demafiles, Commanding Officer of 14IB disclosed that Antonio Burac, known as “Tony” or “Dilon” in the underground movement, 38 years old, married and a resident of Oras, Eastern Samar, who had served the movement for five (5) years initiated an effort to expose some of the arm cache being kept by his former comrades. According to Tony, he could no longer withstand the violation of the people’s rights being triggered by his former comrades because of the armaments that served as an instrument in their inhumane acts. He further said that if his former comrades would get hold of the said rifle, it will surely claim another life of an innocent and peace loving people as they used to do especially to those who are against their revolutionary cause. He and his family promised to support the government’s aspiration to achieve peace and development of the region because he already proved the government’s sincerity when he and his family were given another chance to re-experience the true spirit of democracy and re-build his family in the open that was destroyed by the underground movement. Tony was a former vice squad leader of Omega Platoon of Section Committee North East (SNE) of the Eastern Samar Provincial Party Committee under Eastern Visayas Regional Party Committee (EVRPC) of the Communist Party of the Philippines (CPP). Meanwhile, Major General Mario Chan, commander of the Army in Eastern Visayas expressed his deep satisfaction the way the former rebels act in support of the peace effort in the region. As he commended his troops particularly the 14IB for helping rebuild the families of our former rebels, he further extended his appreciation to the former rebels, not only to Antonio Burac but also to all former rebels who in one way or another help pursue the peace that has long been desired by their fellow Waraynons. “As I have mentioned in the past, these successes can be attributed to our people. They are the very reason why we exist, our services can be fully carried out if our people also show concern, first for the country and second for themselves,” he says. “As we pursue the communist terrorists who do not want peace to reign, our call for them to surrender bringing along with them their firearms in order to once again live decent and normal lives along with their families still stands,” he adds. Accordingly, despite the accomplishments gained by the government troops, he is not happy and satisfied to see NPAs getting killed. “There is no happiness and satisfaction derived from killing NPA rebels. The real sense of fulfillment comes in embracing a rebel back to the folds of law and helps him become productive and contented citizen of this country”. Major General Chan also assured the NPAs who will lay down their arms that they will not be harmed and instead they will be given assistance for them to start a new life, just like what the Burac family is experiencing now. CATARMAN, Northern Samar – In order to play a more active role as agents and catalyst of an accurate and truthful information in the locality, the media practitioners in Northern Samar both print and broadcast has launched a media forum called “Harampang sa Northwood”. A weekly forum which will be held every Saturday from 9 o’clock in the morning up to 12:00 noon at the Sugbaan sa Northwood Music Lounge and Restaurant, Brgy. Dalakit, Catarman, Northern Samar. The group will be inviting government officials and distinguished individuals to apprise and update the media on relevant issues and other important matters affecting the development of the province. This morning’s first Harampang sa Northwood was graced by Col. Oscar Lopez, commanding officer of the 803rd Brigade, Col. Brigido Unay, PNP Provincial Director and UEP President Atty. Mar de Asis and Col. Malinao, the deputy officer of the 803rd Brigade. Present during the forum were Rachel Arnaiz, Rey Ursua and Jean Galit of DYSM, Adonis Rebadulla and Ahmir Ortego of Power FM, John Siervo and Elmer Siervo of Radyo Natin San Roque, Beth Betonio of Radyo Nation Allen, Gary Vacunawa and Rey Dineros of DYLA Allen, Eladio Perfecto of Catarman Weekly Tribune, Tito Tepace of Leyte Samar Daily Express and DYSM, Sylma Lutao of the Provincial Information Office, Romula Obleopas, media relations officer of UEP, Monico Esteria of Waraynon, and Teresita B. Cardenas of the Philippine Information Agency. The group requested the assistance of the Philippine Information Agency to act as the moderator in today’s activity and the succeeding activities to be conducted. The gathering was very successful and well attended by the media practitioners in the area that ended up for about three and a half hour. BORONGAN, Eastern Samar – The Department of Education in Eastern Samar reported that the recent calamity that struck the province has caused P29.5 M in damages to books, school buildings, and instructional materials. In a consultation with specialists from the United Nations Children’s Fund (UNICEF), DepEd revealed that 135 classrooms were damaged because of the rains. The department is currently looking for means to rehabilitate the classrooms and also looking for ways to integrate disaster preparedness to the children’s curriculum. Because of the calamity, classes were interrupted in several areas in the province especially in the northern part. Classes for more than 18,000 students were cancelled because of the heavy rains. Especially in the towns of Maslog, Jipapad, Can-avid and Arteche, classes were suspended for as long as five days. DepEd Education Program Supervisor Mary Moscare, however, confirmed today that classes have resumed in these areas. Because weather reports warn against more rains in the coming months, the department plans to integrate disaster preparedness in the school curricula. According to Moscare, Science and Araling Panlipunan will soon include lectures on how children can prepare in cases of calamities. Part of DepEd’s long-term plan is to help improve the quality of the school building structures in the province. CATARMAN, Northern Samar – Governor Paul R. Daza of Northern Samar has expected the money downloaded to the Pantawid Pamilyang Pilipino Program (4P’s) beneficiaries will help the province in pump priming the economy. In a press conference called by the governor Thursday afternoon, he said that the actual cash money about P200 million downloaded from the national government to the beneficiaries in our province will surely stimulate our economy as this is a big bulk of money given to our poor families. As the program expanded in ten municipalities this year, 20,353 more families will benefit from the program. The towns covered by 4Ps expansion program are Biri, Capul, Gamay, Laoang, Lavezares, Rosario, San Isidro, San Jose, San Vicente and Victoria. The first batch ten municipalities were Palapag, Silvino Lubos, San Roque, Lapinig, Catubig, Mondragon, Lope de Vega, Pambujan, Mapanas and Las Navas. The remaining 4 municipalities were not included because they were not able to qualify the poverty threshold index of the National Housing Targeting System of the DSWD national office, he added. The governor said, we are lucky and I am very thankful to President Noy because out of the estimated 4.7 million poor families of the country only 2.3 million or 45% were identified as recipient of the said program. In Northern Samar 65% of the poor families are beneficiaries of 4Ps. Our poor families are now given better access to education, nutrition and health and at the same time they are given increased purchasing power to procure their basic needs, he further added. Further, more empowered women are given the chance to actively participate in activities concerning community development. It is hoped that the program will slowly break the poverty cycle in the area, and gradually transform the lives of 38,268 beneficiaries. TACLOBAN CITY – “Never say no to a challenge” said the newly inducted chairperson of the tourism board as she vowed to make the region as a major tourist destination in the country. Dr. Aurora A. Villarente, Chairperson, Eastern Visayas Regional Tourism Board (EVRTB) in her acceptance speech pledged full commitment, dedication and support for the improvement of tourism industry in Eastern Visayas. Villarente said that it is a great challenge for her leading the group whose task is to promote the region’s tourism industry to potential domestic and foreign tourists. The EVRTB chair informed she will map out plans together with her co-officers and members of the board and with the help of other stakeholders which will serve as the roadmap in the tourism industry in the region. Eastern Visayas has a big potential in tourism industry that should be complimented with comprehensive and intensive promotional activities in order to attract more tourists to come and visit our region’s promising tourist destinations, Villarente said. She further said that tourism industry provides income and generates employment to people in the region aside from the socio-cultural development it brings to the people of Eastern Visayas. Villarente not only aimed of making Eastern Visayas a major tourist destination in the country but she wanted also to realize the provision of quality tourism in this part of the country. MAASIN CITY, Southern Leyte – “Registrants are coming in,” thus Maasin City Executive Assistant Bethany Niño Gado reported in a live interview over radio station DYDM, referring to the scheduled “Run for the Heart” on February 11, 2011, here in the city. Like the Maasin City’s run, it will be done with a cause. A P150 registration fee will be collected for every participant, with free singlet and a race bib. Other proceeds will be intended for the maintenance of the seminary which started its operations in the 1970s, it was learned. Pope Paul Minor Seminary Assistant Rector, Fr. Joah Tiengco initiated the activity based on the guidelines of the city’s run for a cause. Gado disclosed further that other organizations who wanted to initiate run for health, are the Maasin City Cycling Club, and other organizations from other places that also expressed to replicate the same. He said that the run/walk is an exercise that is good for those with cardio vascular illness and can regulate blood circulation, not to mention those other good benefits that are good for one’s health, as per doctor’s information. Meanwhile, Gado bared that the city prepared prizes for the city’s first “run for the heart”. To be done in two categories, the 3-kilometer run, with prizes ranging from P1,500, P1,000 and P700 for the first, second and third winners, respectively. While, the 6-km run have P2,000, P1,500 and P1,000 for the 1st, 2nd and 3rd winners, respectively. For the 1st city’s run, a registration of P100 will be collected to defray expenses like T-shirt, singlet and a race bib. The deadline of registration will be on February 1 and participants are also required to sign a waiver clarifying that they are fit to run. VARIOUS media groups in Western Visayas condemned the violent attack against The Daily Guardian publisher-editor Lemuel Fernandez in the evening of January 26. The National Union of Journalists in the Philippines (NUJP)-Iloilo headed by chairperson Bert Ladera of RMN-Iloilo called on the PNP to thoroughly investigate the attack. The NUJP also urged members of the tri-media to be always on guard and put personal safety above all other priorities. “The failure on the part of concerned authorities to take appropriate action on the matter may cause a chilling effect to other media colleagues who are being regarded as defenders of press freedom. Let us not allow the perception that society today is getting harsh and lawlessness is creeping in our midst,” NUJP-Iloilo said. “This is one way of telling the media to be quiet on the controversial and high profile issues they tackle on print, television or radio. We condemn the fact that a notorious act like attacking a mediaman is the way to stop us in pursuing controversial issues. We are also calling the authorities to immediately resolve the case,” the ICPC said. The Iloilo City Hall Press Corps (ICHPC) led by Richard “Boboy” Sombero of dySI-Super Radyo said the attack on a journalist cannot be tolerated in a peaceful community. The ICHPC said the media is defender of the press freedom, advocate of peace and development. “We are not an enemy. We are just carrying and delivering the message,” the group said. “We urge the members of Philippine National Police to guarantee a peaceful and safe society and immediately resolve and identify the culprits of this inhumane act. We are calling our colleagues to be on guard as always, and put safety above all priorities,” the group added. The Philippine Tri-Media Multi-Purpose Cooperative (PTMC), Iloilo Police Defense Press Corps (IPDPC), National Union of Journalists of the Philippines (NUJP-Negros Occidental) and Negros Media Council for Press Freedom (NMCPF) also condemned the attack in a joint statement. “It is a stupid, senseless, and shameful act befitting only of barbarians and those who choose to remain uncivilized in a modern world,” the groups said.